(CNN) - Ron Paul’s loyal supporters helped him set campaign fundraising records and capture more delegates during his presidential run than some of his high-profile Republican rivals. They even managed to briefly shut down Nevada’s GOP convention earlier this month over a rules change controversy. Now they’ve taken his latest book to the top of the Amazon.com bestseller list. “The Revolution: A Manifesto”, released earlier this month, is currently No. 1 on the Web site’s list of top sellers, besting even Oprah’s latest Book Club selection. Are democrats so desperate for a "female" president (or wealth) that they are blinded to the Clinton scandals of the 90's? Let us face it, Bill was NOT responsible for the economic fortunes of the 90's. Hillary was too busy with a "failed" health-care policy!! Have you forgotten the INTERNET burst? Have you forgotten the Republican Senate that forced Bill to raise taxes? Have you forgotten the items that Hillary stole from the White House? The Republicans are hungry; they want to run against Hillary. I rest my case; give Hillary to the Republicans!!! Though Ron Paul never had a shot in hell of winning the nomination, hopefully the vast majority of his ideas (which are excellent and in accordance with the center-right libertarian views most Americans hold) are taken into account by whoever becomes president in November. "Which one of the two is older? Paul or McCain?" Paul is 72, McCain is 71. Paul looks a lot better, like a guy who's done long distance running. I always liked Paul. Most of his positions made a lot of sense. I was disappointed with the way he was sidelined by the media, but not surprised. don't buy any spins coming out of the corporate media! few if any has changed their mind about whom to support! get real news produced by people with integrity, insight and perspective! i like Ron Paul's foreign policy..i think he has the constituion down packed..and he can teach us a thing or two about our country's contract in the consitution. I wasn't surprised about his Nevada support because frankly people are suspicious of the 'status quo' or 'eliest club' (HRC, BO, JM)..... in my work enviroment he is beginning to look like the watermelon of the picinc (the best part). I still haven't given him my vote but they way things are going...who knows. Ron Paul, you are the Man. You are the only true American Statesman by strictly adhering to the Constitution and pursuing a nonnegotiable path of Liberty, Peace and Sound Money! May you always reap abundantly of God's Blessings! 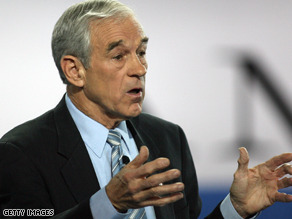 Ron Paul is the Ron Paul of conservatives. Comparing Paul to Wright is a transparent attempt to score a cheap shot. Why is an honest, principled politician who courageously and consistently speaks out against threats to personal liberty and freedom such a foreign concept that drives people to marginalize him? For those who think Ron Paul is all about the constitution, consider one thing please. He wants to abolish the census. Without the census we would not have an accurate count of citizens in each state, therefore there would not be equal representation in the House of Representatives. Is this constitutional? I will be the first to admit that I do not agree with all of his policies. However, he is the first person that I've donated to. The first politician I will defend in debates amongst family and friends. The first politician that actually had be debating on running for mayor of my town, i'm two years too young. I have no doubt in my mind that everyone is itching for Ron Paul to do well, but have a certain someone over their shoulder holding them back. Sometimes doing the right thing isn't always the thing we want to do. Hey Tony from Miami, Ron Paul is older then McCain, but age has nothing to do with this election, or any election for that matter. Ron Paul is older, yes, but a million times wiser and way better to lead this country then McCain. The new book is a great read for anyone, regardless of political affiliation. The majority of the world wants Ron Paul to be the next US President. P.S. HOW COME few has changed their mind on either side, no matter how much the corporate media and their neocon masters try to crucify Rev. Wright for tell ing the truth? Racists and fascists are what they are because they are too stupid to understand what they are. they are incapable of changing their minds and hearts. in order to save them (and the entire humanity) from themselves. they know not what they are doing. think about Jesus christ. hime being crucified for them hasn't done much good either. God knows you're trying your best as a politician. Michele Obama will make an outstanding first lady, intelligent, well spoken, committed and principled! He wouldn't be so huge if he wasn't the only candidate filling the empty civil libertarian void in this country. I am not one of his supporters but NO candidate has been bold or brave enough to straight up denounce big brother in the United States. That scores huge points with me but since he isn't that concerned with environmental issues I never became a supporter, and frankly I don't know how so many young people side with his position on this, which is to leave ecological health of the planet in the hands of corporations. I love the photo on the back of The Revolution: A Manifesto; Dr. Paul looks very Presidential. He is older than McCain and I hear he runs 3 miles a day plus is one of the rare "Bionic Congressman" in the Legislature, having two cybernetic knees. He has publicly claimed one of his few vices is "Chocolate Chip Cookies" and "Exercise". McCain looks like he was eaten by a wolf and shat off a cliff.